Ingredients (INCI): Lawsonia Inermis Linn, Indigofera Tinctoria, Emblica Officinalis Gartn, Eclipta Alba, Azadirachta Indica. Ayurvedic hair dye INDIAN HENNA on henna basis consists of 100% natural ingredients. It's quite difficult nowadays to find organic, high quality, non-toxic hair care products that have not been tested on animals. I found it` s important to find a product that meets all of the above criteria. Of course, I've heard many times about the healing power of henna, and finally I decided to try is it true. Since then 4 years has passed, and now I regularly use henna for health. During this time I've learned a lot about henna. For example in India people use this natural color almost every week and henna is included in many organic shampoos and conditioners. It protects hair from hot sun rays, improves and enriches hairs with minerals. Henna has a symbolic meaning in Eastern cultures, such as India, Mehendi (henna tattoos) are used in celebrations, weddings and other special occasions traditionally associated with transformation and transition to a new phase. It is used to show belonging to one's religion, but what is very important - not with arrogance. Henna`s healing properties are also used in medicine and in the treatment of almost all cuts, for many skin diseases, it alleviates pain and improves mood. Another interesting fact about this product - unlike other colors new mothers who breastfeed can use henna. I immediately realized that i have to choose henna hair mask carefully. First of all i had to pay attention to the price. Henna's quality was a crucial factor! If we are talking about naturalness then it is not worth looking for henna powder cheaper than 4-5 EUR per 100 g. The cheap packaging of the so-called Iranian henna, produced in Russia, is not the best solution. This does not mean that the most expensive color is always better, you need to take into account other criteria, but you do not have to buy the cheapest option. Second, it's color. It all depends on what kind of shade you want - dazzlingly red, brown or black. I tried both the standard red and dark henna, and I mixed it with coffee. The uniqueness of the Indian Henna`s color is that it is not necessary to experiment every time with the mixture worrying about what tone will come out of it. You can use ready made compositions specifically designed to give you the best shade. Based on your choice you may buy three brown colors (light, medium and dark), reddish and black. Third, you need to read the annotation. The unique benefit of Henna is the variety of useful herbs what are included in it. And even if you do not want to change your natural color, colorless henna can be applied to rejuvenate and stenghten the hair. Henna (Lawsonia inermis) – henna has a significant therapeutic effect on the hair, it nourishes and moisturizes from the roots to the ends of the hair, improves microcirculation of the scalp, softens, makes the hair easy to comb, increases hair thickness, volume and gives them a beautiful shine, henna keeps hair color, gives a pleasantly cool feeling, reduces fatigue. Indigofera (Indigofera tinctoria) – stimulē matu augšanu, mazina iekaisumu, novērš blaugznu rašanos, dod matiem skaistu spīdumu, padara matus mīkstus, maigus, paklausīgus un vieglāk ķemmējamus. Amla (Emblica officinalis) – stimulates hair growth, reduces inflammation, prevents dandruff, gives the hair a beautiful shine, makes the hair soft, soft, obedient and easier to comb. 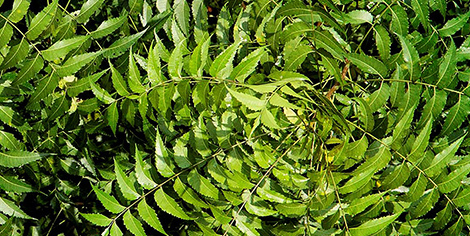 Neem (Azadirachta indica) – It is a very effective treatment for hair, restores dry hair, prevents from fungi growth and dandruff, reduces inflammation, prevents from dry skin, scaling, itching and various skin diseases. I use henna every 2 months to paint the grown hair roots. This healing mask is very simple and possible to use at home. Only have to dilute the powder (I usually took 50-75g of Indian henna) with boiling water, and then mix. It is important to remember that the mixture should not be too fluid, but look more like sour cream. That's it, henna is ready to use. I usually paint dry hair and leave henna there during the night and in the morning thoroughly wash all the henna out. Then I also use shampoo. As a result, the hair becomes shiny, dense and looks impressive. And most importantly - it`s more than natural! Because henna is a complete therapeutic and organic complex for treating hair. Prevention with henna is an easy and inexpensive way to heal your hair. Even if you regularly use chemical paints, why not stop and give your hair a rest. Just do not forget - it is advisable to wait for at least three months (depending on how bright the color was used) before applying henna after chemical dye application. The real, high quality Indian henna can be purchased online http://www.herbals.lv/en/Ayurveda-For-Hair-Health and shop Pērses ielā 16!